In the near future, political tensions between the United States and China are at an all-time high. Then a catastrophic explosion on the moon cleaves a vast gash in the lunar surface, and the massive electromagnetic pulse it unleashes obliterates Earth’s electrical infrastructure. To plumb the depths of the newly created lunar fissure and excavate the source of the power surge, the feuding nations are forced to cooperate on a high-risk mission to return mankind to the moon. Now, a diverse, highly skilled ensemble of astronauts—and a pair of maverick archaeologists plucked from the Peruvian jungle—will brave conspiracy on Earth and disaster in space to make a shocking discovery. 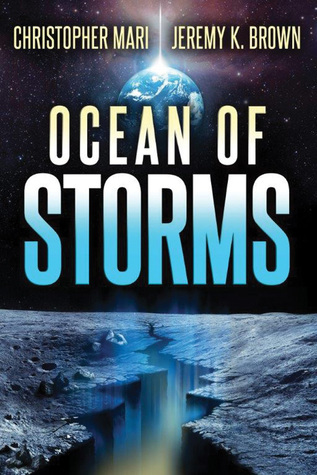 Ocean of Storms is an epic adventure that spans space and time as its heroes race to fulfill an ancient mission that may change the course of humanity’s future. In the not-so-distant future, an explosion on the moon generates a world-crippling electromagnetic pulse. Tensions between the US and China mount to an all-time high, as the two countries begin a renewed space race to discover what tore a huge gash into the moon’s surface. Renegade archeologist Dr. Elias Zell and his protégé, Alan Donovan, join NASA astronauts and train for the trip that could finally answer the question of whether we are alone in the universe. International conspiracy and intrigue force cooperation between the superpowers to give the mission any shot at success. For Donovan, completing the mission will give him closure with his father, a disgraced former astronaut from the Apollo program, as well allowing him to be first on an earth-shattering discovery that will change mankind forever. This fast-paced read will keep readers engaged to the final twist and turns as the conspiracy unfolds. Mari and Brown’s first SF collaboration is a good pick for those new to the genre as well as more seasoned readers. Jeremy K. Brown has authored several biographies for young readers, including books on Stevie Wonder and Ursula K. Le Guin. He has also contributed articles to numerous magazines and newspapers, including special issues for TV Guide and the Discovery Channel, and recently edited a collector’s issue on Pink Floyd for Newsweek. Jeremy published his first novel, Calling Off Christmas, in 2011 and is currently at work on another novel. He lives in New York with his wife and sons. Christopher Mari was born and raised in Brooklyn, New York, and was educated at Fordham University. He has edited books on a wide variety of topics, including three on space exploration. His writing has appeared in such magazines as America, Current Biography, Issues and Controversies, and US Catholic. His next novel, The Beachhead, will be published by 47North in 2017. He lives with his family in Queens, New York.